Widen KY 338 (Richwood Road) from two to four lanes with multi-use paths on both sides of the roadway. Provide multi-use paths along both sides of the roadway. KY 338 to the east of this project is proposed to be widened from Triple Crown Boulevard to US 25 (Dixie Highway), as part of the reconstruction of the I-71/75 interchange at KY 338. This project will extend KY 338 widening improvements west to Hicks Pike. 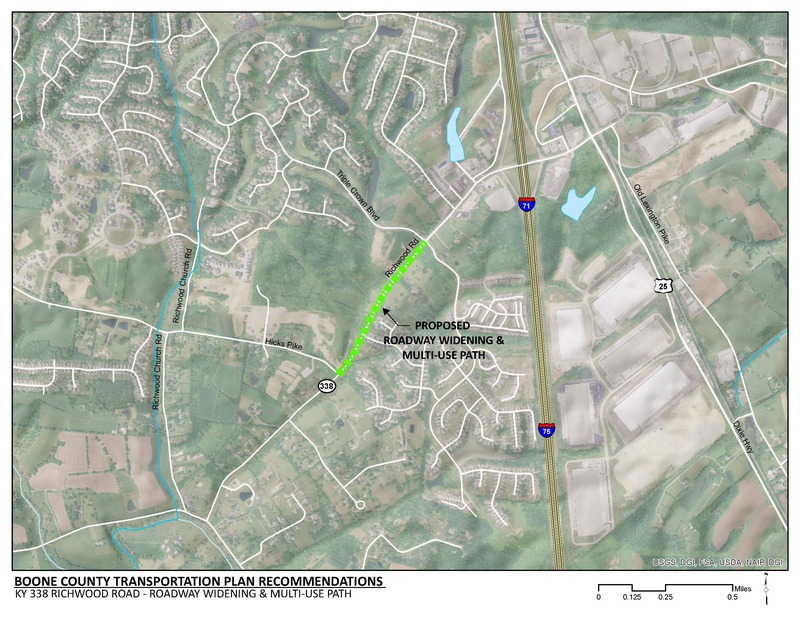 New sidewalks or multi-use paths will extend the proposed multi-use paths that are incorporated in the adjacent interchange reconstruction/widening project. This project is consistent with Boone County’s overall goal of improved safety and connectivity for bicycles and pedestrians. Click HERE for a map of multi-use paths in Boone County. A potential hazardous materials site has been identified within the project area. The project will need to be coordinated with the adjacent project I-71/75 interchange improvement at KY 338. Traffic demand along Hicks Pike is expected to increase as the residential development expands. Residential development planned along this roadway is expected to use KY 338 as a primary connection to I-71/75. KY 338 through the project area serves Triple Crown, one of the fastest growing residential developments in Boone County. By year 2040, population in the area is expected to grow by 5,000 homes. The crash rate along this segment of KY 338 is 38 percent higher than the statewide average of similar roadways. As traffic volumes increase, the frequency and severity of crashes is expected to increase within this segment. There are no dedicated bicycle or pedestrian facilities along this roadway. There are multi-use paths proposed along KY 338 from Triple Crown Boulevard to US 25 (Dixie Highway) in theI-71/75 interchange project.